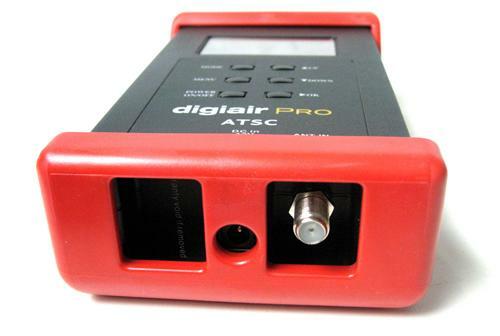 Our Solid Signal DigiAir-Pro-ATSC is a great, full featured antenna meter that not only shows signal strength but also several different measurements that are more important like bit error rate and signal to noise ratio. These other numbers actually have more to do with whether you’ll get a marginal station than raw signal strength. It’s more expensive than a simple signal finder, but costs hundreds less than other full-featured meters. Recently we heard from one of our customers that he experienced a problem with “spectrum” mode, where you can look at signal from up to six channels at once. We put our developers on the task, and the result is new firmware, which you can download here. This will update your meter to version 2.1.7 and eliminate that problem. If you’re not seeing problems with your meter, this isn’t a “must-have” update, as it only fixes this one issue. If your meter is working well, there’s no need to update. Updating these meters involves the use of one of these interface cables, which allows any computer with a USB port to communicate with the meter. Future meter designs may have a USB port which would mean you wouldn’t need a special cable but for now, for the meters out today, you do. Could DISH black out 112 stations tomorrow?